Planning For Retirement For Physicians Part 6: Should I Do A 401(k)/403(b)/457? This is the sixth in a series of posts made in preparation for a presentation I will be making for physicians in fellowship training at an upcoming ACCP meeting. In the last post, I discussed the basics of how Americans are taxed. In this post, we’ll cover whether physicians should put their money into a 401(k)/403(b)/457 or should they instead go ahead and pay income tax now and then put the money in a regular investment account in order to maximize the eventual value of that investment in retirement. If the goal is to use that money in retirement, then the answer is almost always to put it into a tax-deferred investment (401(k), 403(b), or 457). The reason is that the tax-deferred investment gets taxed once and the regular investment gets taxed twice. What the analysis above shows is that there are several things happening from a tax standpoint that most investors don’t take into account. First, by reducing the take-home salary from $258,000 to $238,000, the income tax bracket of 28% does not change but the effective income tax rate does drop from 23.5% to 22.7%. This drop in the effective income tax rate results in a $1,918 reduction in income tax that year. Second, if instead the investor had paid the regular effective income tax rate of 23.5% and put the $20,000 in a regular (post income tax) investment, then the investor would have to pay tax a second time in the form of capital gains tax when the money is withdrawn in retirement. 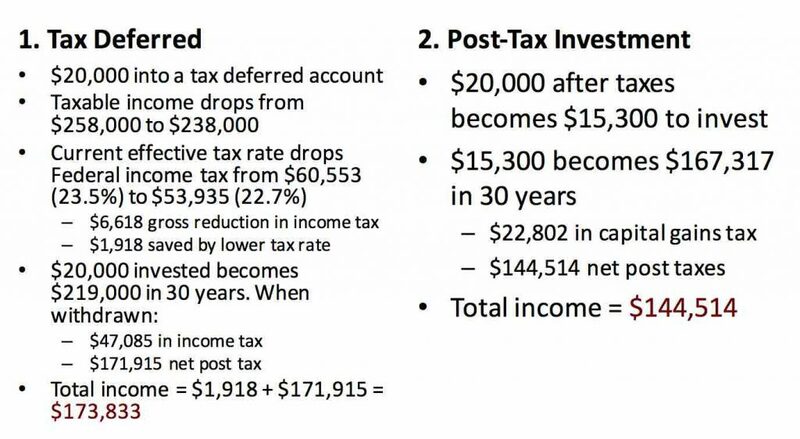 The net result is that the investor is better putting the $20,000 into a tax-deferred account from the beginning and ending up with $173,833 when they retire versus $144,514 if they had paid regular income tax on the $20,000 up front and then put it in a mutual fund investment. You can even further improve your financial picture if you take the $1,918 that you saved from having a lower effective income tax rate and investing it in a regular investment account or (better yet) in a Roth IRA. 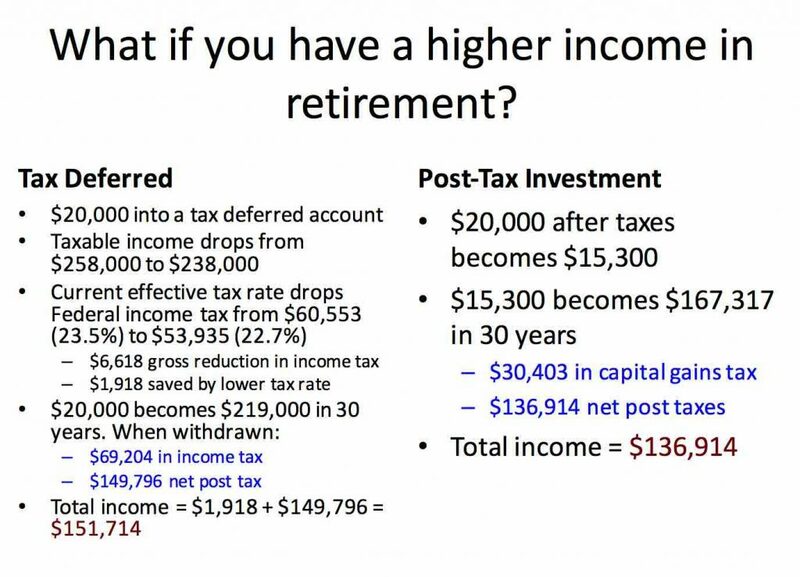 What this analysis shows is that you still come out ahead by putting your retirement investment in a tax-deferred account, even if your income will be much higher in retirement. Some physicians will have a choice between a regular 401(k)/403(b) and a Roth 401(k)/403(b). The decision about whether to put retirement in one or the other can be a tough call and really requires careful analysis of the individual’s personal tax situation. The traditional wisdom is that if your post-retirement annual income tax rate will be higher than it is now, then you are better off with the Roth 401(k)/403(b) and if your post-retirement annual income tax is lower than it is now, then you are better off with a traditional 401(k)/403(b). What these recommendations don’t take into account is what the effect of taking a Roth 401(k)/403(b) will do to your current effective income tax rate, namely, that it will go up since your taxable income goes up by the amount of the Roth 401(k)/403(b) contribution. As I mentioned in a previous post, you can’t predict what politicians will do to tax rates 4 years from now, let alone 35 years from now. My own take on it is that unless you expect your post-retirement income tax rate to be considerably higher than it is now, you are better off with a regular 401(k)/403(b) and not a Roth 401(k)/403(b). The last situation to consider is whether your employer offers a matching 401(k) or 403(b). If they do, then this is an even stronger reason to put your retirement savings into a tax-deferred 401(k) or 403(b) since the matching funds are free money and who in their right mind would ever turn down free money? The bottom line is that for the typical physician, you will almost always be better off putting your retirement funds in a tax-deferred investment. This includes the 400-group of investments (401(a), 401(k), 403(b), 457, or 415(m)), a pre-tax traditional IRA (as a physician you will likely make too much money to qualify for one of these), or an SEP. In the next post, we’ll examine the question of where you should put your post-tax investments: a traditional IRA, a Roth IRA, or a regular investment.